﻿We specialize in the repair of adjustable bases in the Dallas-Fort worth area. call now to speak to a repair specialist. If your adjustable bed is not working properly or has completely stopped working altogether, we are your go-to repair specialists for all adjustable bed bases. Our repair technicians have years of experience working on all of the major manufacturer's adjustable bases and can solve any problem you may have, from noisy massage motors, to a malfunctioning lift motor, or changing out a faulty control box. We can diagnose and repair any problem you may have. We understand the importance of these repairs and take that into consideration any time we receive a call from a customer to make sure we send a technician out to your home in a timely manner. Your bed may have stopped working while in an upright position that is stopping you from being able to sleep properly - this is definitely a reason to call us. In these types of situations we can often times get a technician out to fix your bed within the same day. Our team works directly with manufacturers to secure the original replacement parts for your adjustable bed. A lot of these parts we may already have in stock, but if we do not have your part, we can get any part from any manufacturer to repair your bed. Often times, our partnerships with these manufacturers allows us to get these parts below retail cost, meaning it may be more beneficial to call us about replacement parts prior to calling the manufacturer direct. Unfortunately, there are a number of issues that our customers encounter with their adjustable beds that are quite common across all brands of bases. The reason we mention this is because a lot of our customer’s first questions to us when we arrive to repair their bed is “Is this a common problem with these beds?” That question is a bit difficult to answer because we naturally only hear from people with broken beds, but generally we can say that the issues we do see are the same across all brands. Here’s a list of some of the most common issues that our customers encounter with their beds and some accompanying reasons why these things happen. You may notice that the massage motors on your bed over time can become louder than they once were when they were new. You could begin to hear a “rattling” or just a louder than normal vibration. This could happen for a number of reasons, but typically it’s just a sign that your massage motor is going out and should be replaced. Another symptom of a massage motor that is about to bite the dust is that it may not be as powerful as it used to be. The motor within it can become weak to the point where you can no longer feel the vibration. If this is the case, you will need to replace the massage motor. Most of the adjustable bases have two motors – one for the head lift and one for the foot lift. If either your head or your foot motor has stopped working and will no longer move either up or down any longer, this usually means that the motor itself has gone out and needs to be replaced. If both your head and your foot stop working at the same time, this usually means that your main control box has gone out. This is the “brain” of your bed that all of the component typically plug into. You should also double check to make sure it is not just dead remote batteries. When nothing is working on your bed, including head/foot motors, massage motors, etc., there are a few different things that could be wrong. In most cases, this means that your main control box has gone out. However, there are a few brands of beds that have a few additional components that could cause this issue. Some beds have remote receivers that are separate components from the main control box, and when these go out, it would also result in a “dead bed”. 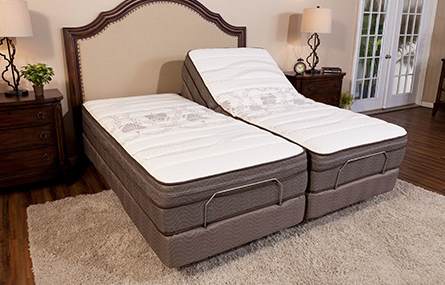 If you have a split king set-up with the two mattresses synced up so they move up and down together, some customers experience an issue where the mattresses are slightly off and not coming up or down at the exact same time. This issue can be resolved by doing some adjustments on the torque tubes of your lift motors to get the two sides of the bed synced back up. ​Our service area is the greater Dallas-Fort Worth area. We’ve outlined some of the specific areas we service below. However, we know that there are not many service companies who work on these adjustable beds, so in certain cases we are willing to go as far west as Abilene, as far north as the Oklahoma border, as far east as Louisiana border and as far south as Waco area. If your area is not listed below, please just contact us and we will let you know if we can service your area.